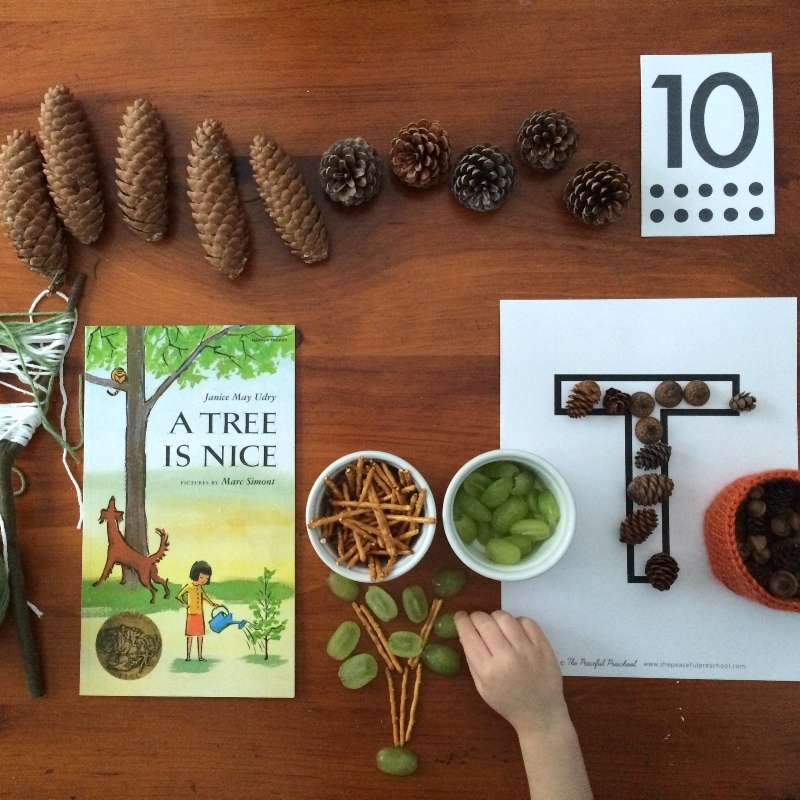 Last spring I shared here on the blog about a tree unit study our family was enjoying at that time and that has blossomed into a very lovely preschool collection. You can read a bit more about that learning unit, the books and the activities I shared HERE, as well as the heart of why I love studying trees with my little ones. The study of how a tree begins to grow and how to care for a growing tree. Transferring acorns, sorting tree seeds and watering plants are a few activities we do this week. The study of what makes up a tree and how tree are similar, yet different. This week we measure trees, sort bark, and make leaf prints. The study of the habitat that is within and surrounding a tree. We will explore the world of bugs and birds and other tree dwellers in this week of playful learning. A study on some of the ways a tree gives to us. This week we will play with fruit, making a rainbow fruit snack, apple star print, and learn about some of the beautiful gifts the tree generously gives. My heart is that as you study trees with your little ones you will see your hearts grow together and your roots in your family deepened. This study has a mix of living books, simple crafts, directed printables, fun activities and adventure. You will also find simple food preparation and home skills you can work into the rhythm of your day. These lessons are created with play in mind, but offer some skills an older preschool or kindergarten student will also enjoy as well. They have been loved by my two year old on the simplest level, engaging for my four year old, while still grabbing the attention of my six year old. We have been testing out and trying all of these activities in preparation to share them with you. And I have been praying over each mama, and each little learner, who reads and journeys through this tree unit. I am here cheering you on as your love and lead your little ones. You might also like our other post LEARN ABOUT TREES. 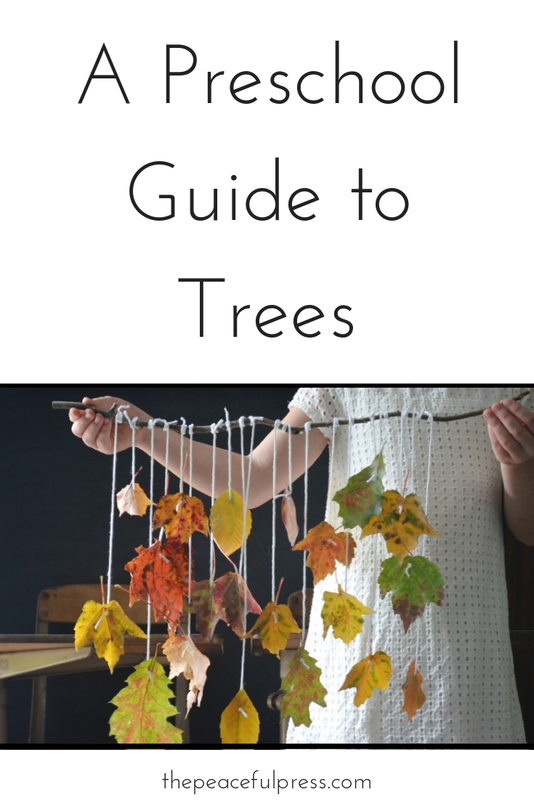 Enjoy this 4 week breakdown of A Preschool Guide to Trees! We love celebrating the changing seasons, and after a few weeks of snow and rain, it is finally, actually looking like spring around here. There are so many things to be amazed by in the spring, and so many ways to develop what Sarah Mackenzie calls, "Radiant Connection". We love to create this connection with our children through books and projects. Click Here To Download Your Free "In Bloom" Guide to Spring Books and Crafts"
As believers, many of our spring celebrations also revolve around acknowledging the death and resurrection of Jesus. One of our favorite ways to celebrate this important time is through our Passover observance. We have kept Passover regularly over the last several years, and love the way the symbolism points to deeper truths, and makes our observances and celebrations centered around resurrection even more meaningful. Whether you are hiding eggs, matzah or simply enjoying the flowers, the new life surrounding us in the spring gives us many reasons to celebrate. If you would like to interject every day of learning with more "Radiant Connection", check out our curriculum. Each parent guide is packed full of ideas for bringing joy into learning and creating connections between parents and children. Our Saints Cards make a wonderful gift for Easter or a Christian Passover observance. Each of the 30 cards depicts a work of art about a saint of the Christian church, as well as a short biography about the lives of these brave people who loved well. This post contains affiliate links. Thanks for clicking through and supporting this site. Check out this sample day, from The Peaceful Preschool curriculum. The daily activities are tailor made for a mix of active and quiet learning, and seasonal play is an important part of the curriculum. What letter are you on? Share, by tagging #thepeacefulpreschool on Instagram, or in our encouraging private Facebook group, available with your curriculum purchase. To purchase the Curriculum, Picture Word Cards, or even grab some of our freebies, click here. For a complete list of picture books used for The Peaceful Preschool, click here. Christmas is coming, and I know the month and a few days until it is here will fly by all too quickly. Making memories with my children is my daily hope, and yet that desire is even stronger at Christmastime. Because my focus is on memories and not on things, we avoid shopping over the holidays, choosing to order a few books and toys from online retailers after the children are snug in their beds, and instead, spend our days baking cookies, drinking cocoa, and reading beloved stories. We also love crafting at Christmas, using our creations as simple, consumable gifts for friends or other loved ones. We have made tiny Altoid tin dolls, dipped and rolled beeswax candles, homemade mixes and cookies, as well as simply potting succulents for a quick hostess gift. Check out this post for a few easy gifts to make with young children. My favorite part of Christmas memory making is definitely the reading aloud however. All the books that we have read not only create plenty of time to cuddle on the couch, but they also give us noble ideas. As we read Little House on the Prairie, we feel more thankful for all that we have, while reading Little Women aloud, inspires us to give to others. These stories, whether long or short, warm our hearts and fill us with joy and hope for the future, something that we all need a little more of. 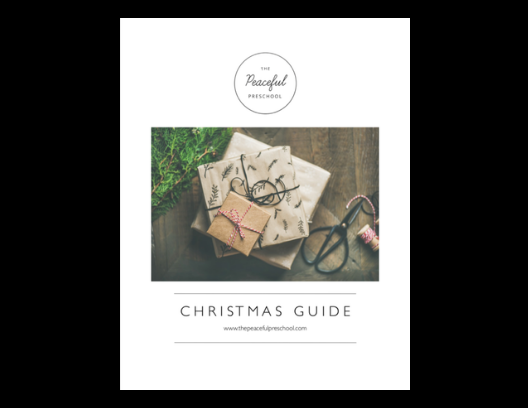 Our new Christmas Guide contains four weeks of activities based around beloved Christmas stories and activities. What are your favorite ways to create Christmas memories? Which books do you read every year? What letter are you on in The Peaceful Preschool? Share, by tagging #thepeacefulpreschool on Instagram, or in our encouraging private Facebook group, available with your curriculum purchase. This post contains affiliate links. Thanks for supporting our work through your purchase. We are fully immersed in fall over here, hitting up pumpkin patches and harvest festivals, and contriving costumes for the various celebrations we are participating in. We are also making a high priority of experiencing all the tastes of fall. We made homemade caramel to dip our apples in, pumpkin muffins to eat with our tea, and apple cider to eat with T.J's maple leaf cookies. We love immersing ourselves in each new season and enjoying all the sights, smells and flavors. I am homeschooling four children this year, and we also have a once a week preschool student. This means that I need to be very creative about how I teach all of these students. It just isn't possible to teach a different curriculum to each child. Because of this reality, I combine several subjects with my children in order to simplify my teaching. This means that my 2nd and 4th grade students do science and history together, and my older boys take an English class together, which combines many high school grades. We also do morning time as a group, which provides great opportunities for the oldest and youngest to learn cooperation skills. If you are using The Peaceful Preschool curriculum, you may find yourself in a similar situation. You may be trying to teach preschool to a 3-5-year-old, while also doing early elementary studies, and caring for a baby. This takes a lot of creativity, but you can very effectively teach multiple grades by combining subjects. Here is a sample schedule for ages 0-8. 8:00 Morning Time - Sing, read TPP picture book, along with any devotional literature or memory work. We also alternate adding a science or history read aloud in our morning time. While I read, little ones may play quietly in the same room, do some of their fine motor activities, watercolor paint, or crayon. I try to offer a tidy snack such a dry cereal or cheese cubes to a toddler and I would nurse my infant (when I had one) during morning time to keep it as focused as possible. 9:00 Language - Review letter of the day with little ones, review any missing phonograms or sight words with early elementary students. Play an object game, phonics hop, or other phonics activity with all emergent readers. This is also a good time for copy work, a handwriting workbook such as Handwriting Without Tears, or an easy phonics workbook such as Explode The Code. 10:00 Outside Time - Take a break to look at leaves and insects, have some tea, change the laundry or put the baby down for a nap. 10:30 Math - Set up a counting activity with math learners. Hands-on math is important for all children below the age of 10. A program such as Right Start Math could be used with multiple ages. Finish with a worksheet drill for older students while little ones get some free time. Any more advanced work such as grammar, map work, or science experiments could then be done in the afternoon while infants and toddlers are napping. How do you manage teaching multiple ages? As we approach the holidays, I am brainstorming for how some of our craft projects could be turned into gifts for grandparents. I am pulling together a list of these ideas, and our L week craft could easily go into a productivity basket, along with a nice pen and notepad or journal. As we read the book, "The Grouchy Ladybug" for "L" week, we chose a bunch of nice river rocks to create painted rocks with. Young children are usually pretty happy to paint on anything, so set up an old sheet outside, along with some rocks and a set of paints. 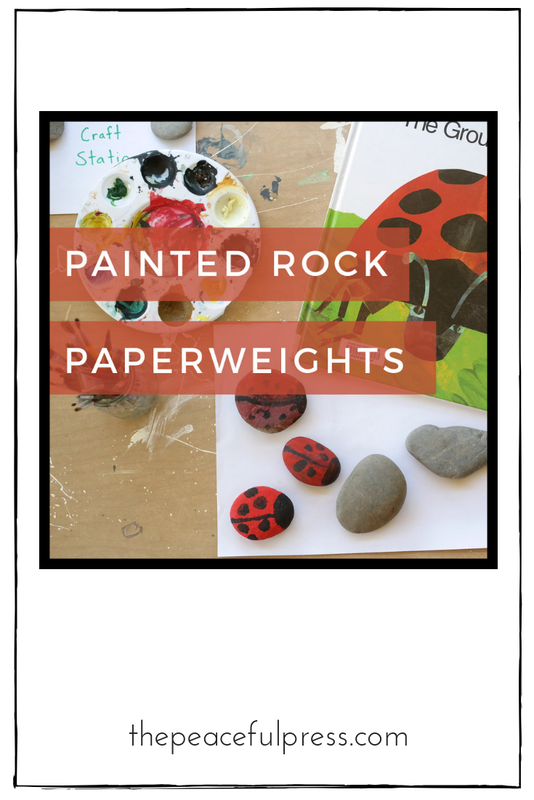 Let your children decorate the rocks as they like, or paint bug eyes and spots on the rocks, and then allow them to dry. An easy fine motor skill, resulting in a great set of bingo markers, or a perfect gift for grandparents. For a complete list of picture books used for The Peaceful Preschool click here. For hands-on learning with your K-6 grade students, check out The Playful Pioneers and The Precious People. As our children begin to discover the beauty of written words, and take baby steps into reading for themselves, there are many factors which help reading click. It is great to keep introducing new letters and their sounds to our children, and to keep reviewing the ones they have learned, but if they don't have strong auditory and visual memory, the process of sounding out whole words will be frustrating. The Peaceful Preschool curriculum very intentionally includes activities to help strengthen these processes. Although every bit of imaginative play that our children engage in are helping with these processes, we can also give them a little more input by doing several activities with them. Reading stories aloud and asking them to tell you about what you read. Playing memory games such as Husker Du, or Art Memo. Playing visual discrimination games such as Bird Bingo and Phonogram Bingo. Using Picture Word Cards and letter flash cards to match beginning sounds with pictures. Doing auditory sequencing with numerals and with words. If you need more insight on how to do auditory sequencing with your child, and you are a current curriculum user, you can check out the demonstration video that I did which is available in the private FB group. If you aren't using The Peaceful Preschool, we would love to have you join us. The curriculum is only $35 for 26 full weeks of daily lesson plans. The curriculum uses classic children's books, along with playful activities to help prepare your child to love learning. If you are wanting to hear from other users of the curriculum before purchasing, check out the visitor posts in our new Facebook page. Several of our community of Peaceful Preschool families posted what they love about the curriculum. If you are using the curriculum, you will know that for the letter K, one of the art activities is scratch art. I know I have said this before, but arts and crafts are not my forte. I love knitting and watercolor painting with my child, but in The Peaceful Preschool it was really important to me to provide a variety of simple crafts to do with your child. This one was very simple and just required a little bit of patience. First we thoroughly covered a piece of cardstock with bright crayon colors. I encouraged the children to fill in any white spots with their crayons. It provided some great hand muscle building, and it didn't at all matter what coloring level they were at. It was full on scribbles. While they are coloring would be a great time to read your picture book for the day. Next, we painted over the whole crayon drawing using black crayola tempura paint. My youngest friend and I didn't cover our scratch art quite as deeply with the black paint, but my 9 year old went to town on it, and it turned out very black! After the crayon drawing was well covered with black paint, we waited. This was when we did some large motor activities, perhaps braiding hemp string into rope, or throwing a ball back and forth. Once the paint was thoroughly dry, I gave my students various scratchers to make a design . Toothpicks, pennies, and forks are all possible implements for scratching though the paint to the bright crayon below. I can't say it was the most beautiful of any craft we have done, but the magical experience of covering up the colors and then uncovering them was delightful for my kiddos. What are some of your favorite art activities so far in The Peaceful Preschool? I just started reading "The Danish Way of Parenting", and I am finding it fascinating. I have made parenting a huge area of study in my life. I love caring for my own children, and find children in general to be perfectly fascinating. This fascination drives me to be continually studying the art and science of parenting, sometimes to my detriment. The fact is, there are many completely opposite opinions about the best way to raise children, and it can lead to a confusing swing of the pendulum as I read and try to apply what I have read. Thankfully, my children are patient, and my husband level-headed. We all survive somehow. This book did highlight something that I think we can all agree on though. There may be many reasons why Danish people score so high on happiness surveys; their reasonable expectations, and positive outlook are just two possibilities, but one big point in regards to parenting, is that they are serious about play. The Danes acknowledge the important work that is being done, when young children are allowed to play. We hope that as you are using The Peaceful Preschool, that you are encouraging a playful and fun atmosphere with your child, and giving them plenty of time to make up their own imaginative games. All of the stories and activities included in the curriculum, are geared toward stimulating even more independent exploration and play. Just add time. If you are on the letter "I" week in the curriculum, we included the book "Ice Cream Summer". Although for most of us, summer is gone and we are enjoying the first joys of fall, ice cream is always on the menu with young children. Simply gather some colored felts and cut out a cone shape, and several scoops. Your children can use the felt cones and scoops for counting, for a play ice cream store, or even for reviewing colors. This can also be done with colored construction paper, using fun scissors to add texture to your scoops. It makes a great scissor skill activity as well. Another fun activity with an ice cream theme is making ice cream in baggies. You need a quart size ziplock bag, and a gallon size bag. Add 1 T. sugar and 1/4 t. vanilla. Place the bag inside of a gallon sized ziplock and add 8 T rock salt and lots of crushed ice. Seal the gallon bag and then have your child shake, knead and squeeze the bag for about 15 minutes or until the ice cream has thickened. Discard the rock salty ice, wipe the exterior of your quart bag, and then scoop the ice cream into a dish and serve. The results; Delicious fine and large motor fun! Craft Stick Raft DIY + Bonus! Preschoolers love water, and while there are many dangers that we must be alert to when playing around water, (never leave little ones unattended around water) there is nothing that can keep them as happily occupied as a shallow bowl full of it. Studying books like, “A Fish Out of Water” provides a fun excuse for getting out a few toy animals, such as those from a Safari Toob and plunking them into the water, and then pulling them out and naming their beginning sound. There are many learning opportunities available when you pair fun books about fish, and sea life with water. Pretend fishing with magnetic letters, counting goldfish crackers, and making a fish bowl sensory bin, are just a few of the activities included in the curriculum. There are also some great crafts in the week that we study F, and one of the easiest was building a craft stick raft. Although the paper plate fish bowl was equally fun, the raft lent itself well to pretend play, giving it a lot of mileage for how simple it was to make. As with all activities involving small objects, parental supervision is a must. Simply allow your child to apply a line of white glue to two of the craft sticks. Lay the sticks parallel about two inches apart, and then apply craft sticks perpendicular to the two gluey ones until you have a little raft. Allow the raft to dry completely. Let your child float the raft in a sink or bowl full of water. Add small toys to the raft to learn about balance, floating and sinking. Parents cut a large circle in one of the paper plates. Allow your child to decorate the other paper plate. They can paint it blue and when the paint is dry, add fish stickers, and green pipe cleaners for seaweed. Parents, glue a circle of the clear material to the paper plate with the circle cut in it.